Here at TREW, we’ve got quite a few Web redesigns under our belt, and time and again we’ve seen the same issues crop up for companies who are redesigning their site, no matter their industry. The Web redesign process is both an art and a science, and it pushes you to prioritize, manage time wisely and focus on numerous elements of good website design and presentation. If you’re thinking about a Web redesign, or are currently in the middle of one, it’s good to know where the biggest obstacles crop up and prevent an on-time, successful launch. Here are the top eight pitfalls we come across most often. 1) Underestimating time to create content. A Web redesign is more than just changes to colors, fonts and photos on your site. Web redesigns also encompass a complete overhaul of page layouts for improved usability and eye scanning. That means your Web content has to be restructured or rewritten to fit the new layouts and to be succinct and impactful – content shouldn’t just be ported over from your old site. It’s also a good time to refresh outdated information in the process. Businesses often don't account for the time required to write, review, and edit content – it can take between six weeks and four months depending on how many pages you’re tackling. You can design and program a website relatively quickly, but it's only as good as the content it contains, so don’t skip this critical step no matter how time-consuming it may be. How many people in your organization are involved in making key decisions about the website redesign? Who is the main “decider”? At most, consider tapping a very small group of internal owners (two to three staff members) and a project manager who is responsible for the site's success and for keeping the project moving and on track. You SHOULD get feedback from other team members as you proceed, but beware: if there isn't internal alignment on goals and focus areas, you’ll deal with lots of different opinions taking you down different paths, and you could end up with - at best - a much longer timeline to go live than originally planned, and - at worst - a disjointed, confusing website going in many different directions, which will put you at risk of failure. 3) Failing to have an overall messaging and positioning strategy in place. Before you build your site, you should ensure that you have clear corporate and product messaging established to convey to your customers and prospects, as that will help you determine your website’s goals as well as all of the elements of your Web strategy, from the site structure, to the language you use to label your offerings, to the information you present to Web visitors on your home page. If you don’t have clear messaging and positioning before you embark on your Web redesign journey, you’ll end up having to define it anyway as you make key decisions about site layout and content placement. This will ultimately slow the project down to a crawl as you and your internal team hash out these details. It’s much more efficient both from a time and cost perspective to have messaging and positioning nailed down first. 4) No clear Web vision or defined goals. Every successful website begins with an examination of strategy and tough decisions on goals and prioritization. What are you trying to achieve? If you kick off a website redesign without first determining your top goals and some measurable objectives for the site, you won’t have a charter to keep you on track. With a vision and goals defined, at every step of the way you can go back to those as guiding principles to ensure that your decisions around site structure, design and content align with them. Without a clear path, you may find that you have wasted the time, effort and cost of a website redesign. When a design trend or new Web functionality takes the Internet by storm, it’s hard not to get excited. The constant evolution of Web design means there’s always some new bell or whistle to fixate on. But the “cool factor” should be icing on the cake, not the cake itself. Avoid focusing on design features or cool functionality before ensuring they will serve your needs. Always start a Web project with your goals in mind and stay focused on what you want to accomplish, and the rest will fall into place. Work with an experienced Web project manager who can walk you through the right steps to get you from point A to point B. It doesn’t mean you can’t have a cutting-edge, modern site, but you want to make sure you don’t let certain features dictate your path. Substance before style is the way to go if you really want results. Many companies think programming when they think Web redesign, and assume that the programmer’s price is the bottom line. But programming is just one piece of the picture. What about Web strategy development? What about user experience and design work? What about the time and cost of migrating content and good QA to ensure site functionality across browsers? There are many facets to a Web redesign, and since your website is the hub of your marketing organization, it’s critical that you account for all of them in your budgeting process. Leaving out Web strategy, or good UX, or any of these elements will mean an inferior site. Just as you wouldn’t build a house without ensuring the plumbing is placed correctly by an expert plumber, or without hiring an electrician to wire your rooms, don’t build a website without having experts in all the key areas involved. 7) SEO is an afterthought. Good SEO strategy is critical to driving new traffic and fresh leads to your website. But good SEO isn’t easy or fast. If you wait until after your site hierarchy is built, your Web content is written and the website has been designed before determining your SEO goals, you’ll have a much harder time achieving them. That’s because you should deliberately build your keywords into your content (not force them in after it’s written) and you should build your site for optimal load times, which influences how high Google ranks your pages. Your SEO goals should be a central element of the Web strategy you develop up front, so that you can address SEO needs at each critical point in the redesign process. 8) Forgetting about your users. Who is your new website ultimately built for? Who will be using it day to day? Be aware that your decisions about how to structure the site, present your offerings and portray your company will have a direct effect on site users. Every step of the way, from determining your redesign goals all the way through to content development, design and programming, you should put yourself in your customers’ and prospects’ shoes. How busy are they when they go online? What platform do they use to surf the Web? What are they looking for in a business like yours? What will compel them to stick around versus turn them away? Ask yourself these questions as you make every key decision about the site, rather than stay in your own head as an internal employee of your company, and you’ll be more likely to navigate your Web redesign ship towards an end result that both speaks to your prospects effectively and engages them in a two-way interaction that brings you closer to achieving your goals. There are many ways the birth of your new website can go wrong, but if you’re cognizant of these pitfalls ahead of time, you’ll be able to organize your team and your approach to avoid most or all of them. Need additional help from a Web expert? Contact TREW for a website audit today! 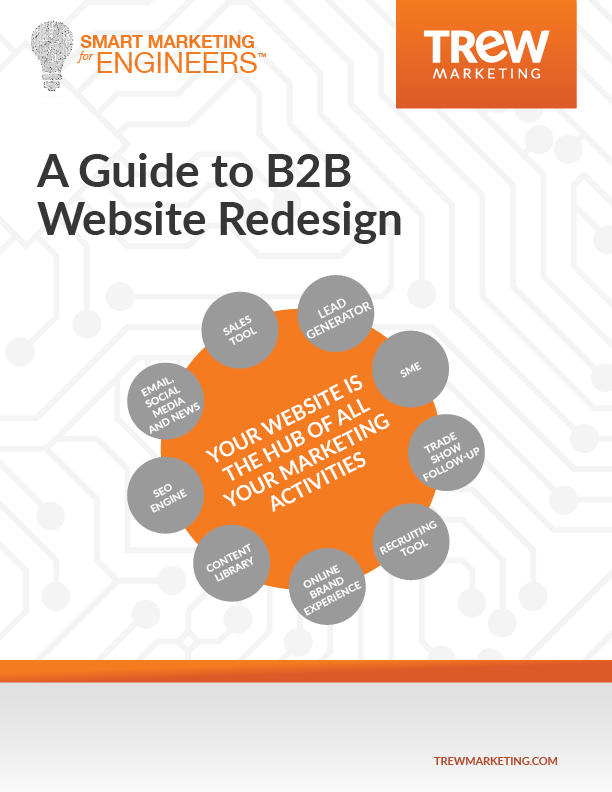 Don't forget to read our Smart Marketing for Engineers: Website Redesign eBook to gain further insight into TREW's proven website redesign process.